Abby the Librarian: Seeds, Bees, Butterflies, and More! Seeds, Bees, Butterflies, and More! 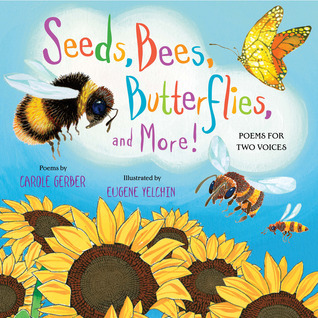 : Poems for Two Voices by Carole Gerber, illustrated by Eugene Yelchin. Grades 1-5. Henry Holt & Co, February 2013. Review copy provided by my local library. As the days get longer, thoughts may turn to spring, making Seeds, Bees, Butterflies, and More! the perfect book to display on library shelves or use in classrooms. Poems in this book feature seeds of all kinds, the plant growing process, and various plants and insects, giving a wide range of spring-related content. The poems are written for two voices, clearly demarcated with indentation and font colors. What fun to have students read these poems together and then ask them to compose their own poems for two voices! Each poem is paired with exuberant artwork by Eugene Yelchin (maybe you know him as the author of the 2012 Newbery Honor book Breaking Stalin's Nose?). The colors leap off the page - bright pinks, yellows, and blues - and evoke spring with every brushstroke. They pair with the poems nicely to create an upbeat tone throughout the book. Carole Gerber includes an author's note giving a little more information about seeds, plant parts, and pollination, but this is most definitely a poetry book. It will add much to science units, bridging the gap between science and language arts, but if you're looking for information you'll need to pair this fun poetry book with another text. Consider pairing this one with Douglas Florian's UnBEElievables: Honeybee Poems and Paintings or Yucky Worms by Vivian French for more on the insects that help our gardens grow. Seeds, Bees, Butterflies, and More! is on shelves now.